George Orwell’s seminal work Animal Farm had warned us about utopia promising revolutionaries, who brain wash masses for achieving their nefarious purposes. Control the information you present to the ordinary people and in turn you can control them. Recently, I came across a thread on Twitter written by Ankit Lal, the Social Media Strategist of Aam Aadmi Party where he made several allegations about EVMs and how they cannot be trusted. Before I proceed with countering his claim, I want to put a disclaimer. I am professionally a chip designer, working in this field for almost 15 years. I specialize in high speed communication between integrated chips and thus can speak with the necessary authority on the subject. The views expressed are solely mine and don’t reflect the views of my employer. I am not a member of any political party, however, I do believe in a certain political ideology. The purpose of Ankit Lal’s thread was to cast aspersions on the use of EVMs and obfuscate the minds of ordinary people by using a medley of technical terms to appear like an expert on the topic. And he did succeed partially for his nonsensical thread was retweeted by no less than Latha Venkatesh of CNBC in all earnestness. Unlike Ankit Lal, I abhor dubious usage of technical terms, so bear with me as I explain the technical terms incorrectly thrown by Ankit Lal in his thread. EVMs used in India are extremely unlike the EVMs used in other countries. 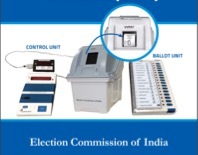 EVMs in India consist of two units – Ballot Unit and Control Unit. Ballot Unit contains the names of candidates, their election symbol and the voting button. The ballot unit remains non-functional unless enabled by election commission appointed officer through the control unit. This prevents the same person from voting multiple times. Ankit Lal started his tirade by claiming that the ‘microprocessor’ used in EVMs can be rewritten. The basic misconception that people have is that EVM’s use microprocessors which are not rewritable. This is also the basic argument which the ECI and BEL use. A non-writable microchip is simple microchip in which the writing pin is programmatically or physically disabled. Firstly, microprocessors and microcontrollers are two different set of devices. ‘Microprocessors’ like the ones in your laptop use a system RAM memory to store program and data information. It can be programmed any number of times. ‘Microcontroller’ on the other hand is meant for use cases where it doesn’t need to be reprogrammed, for example, inside your washing machine, refrigerator and even EVMs. The “source code” is stored in a read-only-memory which is often part of the microcontroller itself. This read only memory used in EVMs is OTP (one time programmable) memory and this was also mentioned in ECI’s press release dated March 16th 2017. This type of memory is “programmed” by blowing fuses at the time of manufacture. It is a physically irreversible process. Hence it is not possible to hack these memory devices later on. Since the same “program” would be burnt in all OTP memories, the same manipulated program would get used in every EVM and in every booth of every constituency. EVM machines are themselves randomly allocated to different booths. Let’s take an example of an election where 4 candidates participated – Candidate listed at #2 is from “BJP” and they have hypothetically hacked EVMs to make him win by counting all/more votes in his favor. So the program says – “Make candidate #2 win”. However, the sequence of candidates would change from one constituency to another. So in another constituency, “candidate #2” might be from congress or AAP. Hence, this strategy of hacking would fail miserably. Ankit Lal’s grand theories don’t stand the test of logic. Ankit’s second claim was that the “wires” between control and ballot unit can be manipulated to make a certain candidate win. A micro size chip on the wire can manipulate the input to get the desired output. Thus without even touching the BU or the CU, the results can be altered. The manupulatibility of wires is an aspect which most of the time is ignored. Now this is based on the assumption that there is a “fixed” wire from ballot to control unit for every candidate. Any electronic engineer worth his salt would have a hearty laugh at this claim. The information is never transferred like this in any modern system. We use packet based protocols with distinctive ‘Start’ and ‘Stop’ markers and use less number of wires to transfer information. This is done for a host of reasons – reducing hardware, making signaling more robust to crosstalk , electromagnetic interference etc. In the picture shown above you can distinctly see a standard RS-232 like connector used in the control unit. This picture is taken from ECI website. So you cannot “rewire” anything. ECI has asserted on several occasions that the EVMs don’t contain any hardware itself to connect the machines to Bluetooth or wireless Ethernet. Recently there was a ridiculous claim that EVM machines are showing Bluetooth signals. It was later found that one of the staffers had “named” his mobile phone’s Bluetooth device as “EVM”. It is similar to choosing a SSID name for your WiFi router. You can safely try it at home. Modi will not get any additional votes. Lastly – Ankit Lal claimed that ECI and BEL (Bharat Electronics Ltd) don’t know what eventually gets burned on the memory chip because it can’t be read back. So it could be compromised. Hence they do “white box testing” and not “black box testing”. Another interesting aspect is that neither the election commission nor the BEL actually know what the code inside the microchip is. They do a white box testing for expected results and not a thorough black box testing. For the non technical readers – black box testing refers to validating something assuming you don’t know what is implemented inside and white box refers to testing the specific implemented design. So not only Ankit Lal used erroneous terms, he also invalidated his actual argument. This is why people like Ankit Lal should stick to their field of expertise. Finally, we all know EVMs were kosher when BJP lost in Delhi, Bihar and Punjab but non-kosher elsewhere. George Orwell would have said, “Some EVMs are more equal than the others”.